There are several legends surrounding the "Great Spirit Spring," however, the following is probably the most true: Wakonda was the beautiful daughter of an Indian chief. From the beginning, the elders of the tribe knew it was unwise for the chief to name his daughter after a god, which is what they considered the spring to be. As Wakonda grew older, she liked to wander the countryside. One day she came upon an injured warrior. After a short conversation, they realized they were from enemy tribes, but that did not stop Wakonda from nursing him back to health. The warrior's name was Takota, the son of the opposing chief. Eventually, he regained his strength and went to Wakonda's father to ask for her hand in marriage.Harsh words were spoken and a battle was fought around the springs. Takota was standing near the edge of the spring when one of warriors of Wakonda's father shot an arrow that hit Takota Mortally wounded, he fell into the springs as he died. Heartbroken, Wakonda dove into the water after him calling to the gods to give back her lover. She never resurfaced. The warriors drew back in awe, and to this day it is believed that the spirit of Wakonda dwelled in the Spring, and perhaps even still in the place of its namesake--Waconda Lake. The Indians believed the water to have healing powers. Practically every Indian tribe visited the site at one time or another including the Pawnee, Wichita, Kaw, Kiowa, Sioux, Arapaho, Comanche, the Miami, the Crow, and others. The Cheyenne and the Arapaho were the last tribes who roamed the plains around the Springs and the Solomon River Valley--a neutral area where all Indian tribes would come to worship the "Great Spirit" on their annual migration with the buffalo herds. From the facts gathered regarding the early history of Waconda Springs, it is learned that the first white man to visit this historic spot was Sir William Johnson in the spring of 1767. The first recorded Kansas history dealing with Waconda Springs tells of the visit by General Zebulon Pike in the year 1814. General Pike, on his trek westward visited an Indian village now known as Guide Rock. During his visit, he learned of what the Indians called the "Great Spirit Spring," a place where for generations Indians had gathered in respect of a Great Spirit. Pike altered his route and visited Waconda Springs on his way to Colorado where he discovered Pike's Peak. The last great pilgrimage of the Indians to the "Great Spirit Springs" occurred during the early 1870s. 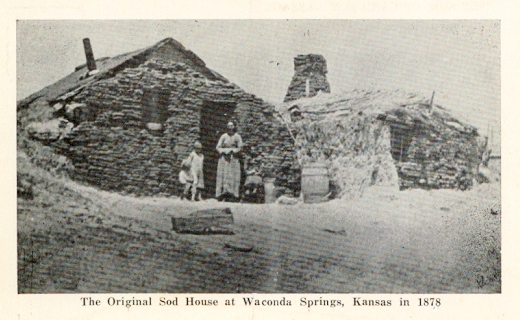 The first permanent habitation at the Springs was a sod house built in 1870 by a man named Pfeifer who took out the first claim on the property. A few years later, history recalls, a man named Burnham who established a bottling works on the site and started the sale and distribution of Waconda Flier, which became known simply as Waconda Water. Burnham raised the interest of a man by the name of McWilliams, an eastern capitalist, who in turn invested in the site. In addition, in 1884, he constructed the stone structure in which the sanitarium group started. It was completed 10 years later. 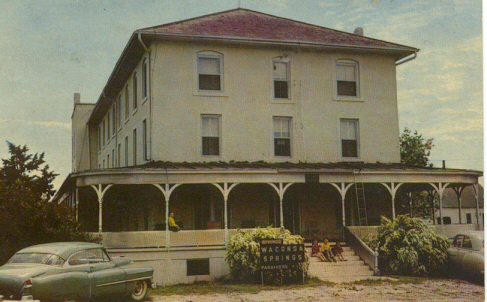 For several years, the place operated as a hotel and resort, the proprietor being G. W. Cooper. During this time, the distribution of Waconda Flier extended to all parts of the country. In 1906, Dr. G. P. Abrahams, who had operated a bathhouse at Mankato, Kansas, for many years, purchased the property from McWilliams. Abrahams was well acquainted with the extraordinary qualities and advantages of the Great Spirit Spring. (The water had won a medal for mineral waters of superior medicinal qualities at the 1904 St. Louis Fair.) He moved his family to the Springs in November of the same year. The future owner of the site, Dr. Carl Bingesser, a member of the Intelligence 'Department of the United States army, visited Waconda Springs around Thanksgiving time in 1906. In June the following year, after duty in Dallas, San Francisco, and the Philippine Islands, he was transferred to St. Louis, Mo. In September of that year, he married Anna Abrahams, Dr. G. P. Abrahams' daughter. Dr. and Mrs. Bingesser resided in St. Louis until April 1908, then they returned to Waconda Springs to make their permanent home. During the years between 1906, when Dr. Abrahams purchased the institution, and 1924, the year of his death, many improvements and expansions were made. Likewise, after his death, the Bingessers who took over the operation, all for the benefit and relief of ailing and health-seeking people, constantly added improvements and facilities. For many years, it stood as a modern institution to which people from all over the nation came to be relieved of their sufferings. It also operated as a modern bottling plant from which Waconda Water was shipped to people all over the country. Then in 1932 their son, the future Dr. Carlos Bingesser, was born at the springs. He, his wife, Marjorie, and their family continued to make improvements and forward the work of the institution. Over the years, the facilities offered physical and hydrotherapy, electric-therapy and dietary procedure. Water from the Spring was piped into every bathtub in the 60-room sanitarium. It was used in a program of internal and external body cleansing. Dr. Carlos used the slogan "It will clean your works until your works work." The scenic beauty with historical connections, as well as the health interest attracted many hundreds of people to the Springs annually. Dr. Carlos dreamed of passing Waconda Springs Sanitarium on to his children, which would have made it a fourth generation spa. But his hopes were dashed when plans of a large earthen dam at Glen Elder, originally discussed in 1944, became reality. The reality of the matter was sealed after the 1951 flood devastated Topeka, Lawrence, Kansas City, and other towns. Demands for flood control was renewed. Dr. Bingesser and others valiantly fought the Bureau of Reclamation and the Army Corp of Engineers in an effort to stop the project. His adversaries, however, just ran the place down and called it a "mud hole." A respected hydrologist inspected the Springs and testified that it was the only one like it in the world. The effort was fruitless, and the construction of the dam which began in 1964, was complete in December 1968. Compounding the loss of the irreplaceable landmark, the builders of the reservoir piled the remaining debris from the sanatorium into the Waconda Springs before it was covered by the waters of Waconda Lake. In the end, perhaps the "Great Spirit," gained a new, more expansive home for its legend to continue.